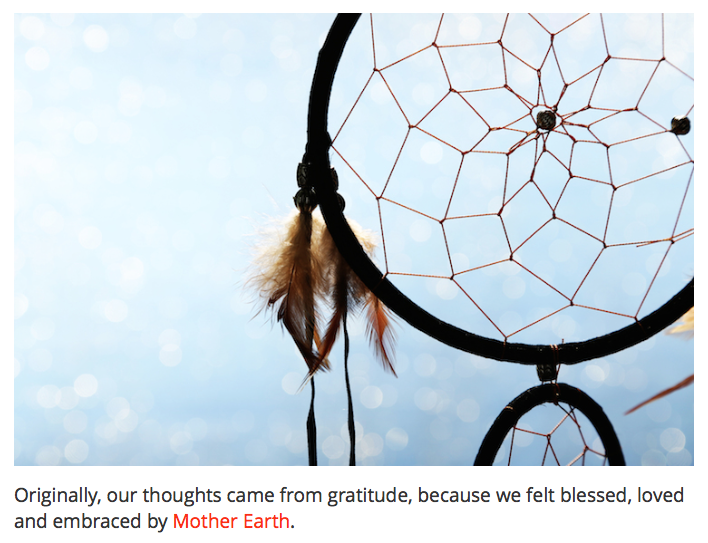 Originally, our thoughts came from gratitude, because we felt blessed, loved and embraced by Mother Earth. We weren’t just living on Earth; we were embedded in and of the Earth—participating in the renewal of cycles as they manifested in the movements of the sun, the rain and snow; the migrations of animals; the return of berries and seeds, fruits and nuts. We came from Earth and, in death, returned to her. All was part of the circle of life, known as the Sacred Hoop. hello ! So excited to be part of community! I humbly bow as I enter the sacred circle. What we share, may it become nourishment for us and our commUNITIES. I look forward to listening, reading and sharing with you all my fellow brothers and sisters. Namo Namaha…. It’s an honor to come into the circle. Blessings and thanks for creating the opening for the sacred. This more than many other things is needed for our world. It touches my heart deeply and has had great and profound meaning in my life. Blessings! Thought I would share this story, I wrote this to some friends today and thought it fit with the discussion. Over my 23 now year journey as a universal healer I became a storyteller a spokesperson for the Ancestors. Because I hear them they ask me to share their stories. One year I was invite to share a story at an Indian Summer ceremony. The Ancestor that wanted to speak was called, “White Raven Seven Feathers”. She spoke to us all about our fixation with our outer world. She told us that once long ago before the tribes separated we could always identify the wisdom keepers at birth…because we were paying attention to the soul not the flesh. But today we are consumed by our attention on the outer…so we fail to recognize the wisdom keepers today. Often we are forced to even hide for being the wrong color. ( I can relate to this) She said we had to learn to look at each other from the inside out…we all have red blood and the same exact organs. We are all human— that’s the heart of the matter. Seek to be true human beings. What is a true human being? A person who understands that they have to be re-spons-able for their own path while honoring the paths of others. Walk softly on the Earth with care and steward-ship for this ship belongs to us all. When you have plenty, share: time, energy, money, love, food, kindness, hugs, positive words, uplifting thoughts, goodness, understanding, compassion, information, awareness, sustainable practices, laughter, joy, toys, cloths, homes, cars, horses, chickens, goats, plants, trees, rivers, oceans, lakes, mountains, rocks, songs, stories, dancing, singing and most of all HEARTS full of LOVE with each other! Thank you for the opportunity to dialogue with others who seek to learn. I too am a life-long learner. I’m eager to learn from this group through the dialogues we will share. I feel at home here and for this I am filled with overflowing gratitude. I have sent information about your book ,Glenn, out to those on my facebook page and have had more replies than to anything I have ever posted. I think people are ready to hear your words and to participate in Dialogue. That is very good to hear. Like dialogue, I did not write the book with an expectation of a result, but if the message resonates, I certainly am pleased. It is time to remember that we are the water, the air, the fire, and the earth, and to welcome all the elements as kin. Thanks so much for sharing.